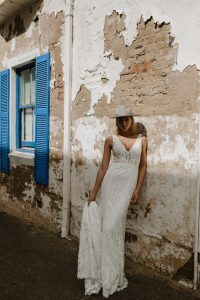 Rosie has a bodice combines a simple shape – a deep V neck and wider straps – with semi-transparent lace panels over the midriff, shoulders, sides and back. The back is low, with a row of lace-covered buttons to secure. Available in ivory as shown.